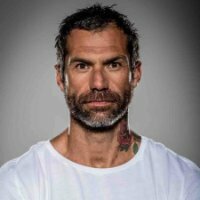 Damien Rider is an Ultra Endurance Athlete who recently broke a world record by on a Prone Paddle board boarding 800km from the Gold Coast to Bondi (solo and unsupported). More recently he skateboarded (yes skateboarded) from Chicago to Santa Monica some 3600km. He has also paddleboard & ran around Phuket Island 3 x times in a row 400km, and last July ran the Gold Coast marathon (42km) carrying a 16kg mattress to promote a new Health & Fitness retreat he has co-founded in NSW. What makes Damien and his story so inspiring is the fact that he is a victim of Child Abuse. Traumatised as a child and youth by an abusive adult his life could have gone in a very different direction. However, he had the strength, willpower and mind-set to achieve unbelievable feats. He has boundless energy and is a prime example of what one can accomplish even through great tragedy and adversity. Damien has established the Rider Foundation & PACA (Paddle Against Child Abuse) with the aim of supporting victims of Child Abuse and has a vision of building retreats globally where victims can be supported to overcome their trauma and was the founder of the first Child Abuse Awareness Weeks for Thailand and Australia. If you don’t book him for those achievements, you have no heart. Damien has also had a feature documentary produced (Heart of the Sea) by National Geographic, has a TV Series in discussion, won the 2015 Men’s Health Man of the Year Award, has been nominated for Australian of the Year this year and has also founded Rider Cosmeceuticals (skincare) and Rider Active wear (mainly compression gear). He is charismatic, raw, passionate and articulate. He would make an ideal speaker for anyone seeking a motivational/inspirational/mind-set keynote. He is based on the Gold Coast but available to speak nationally. To get an insight into what makes Damien such an inspiring speaker, please click here to go to our YouTube Channel.